Since autism was first described more than 60 years ago (Asperger, 1944/1991; Kanner, 1943), researchers have been trying to pinpoint the underlying basis of the disorder. Yet autism still continues to perplex, even though the need for an understanding of the disorder is clear. We know, after all, that autism is a life-long disorder that has a substantial effect on the individual, their family, and society. And recent UK estimates indicate that the prevalence of autism is high: 38.9 per 10,000 for autism and 116.1 per 10,000 for the entire autism spectrum (Baird et al., 2006). My research has concentrated largely on the underlying cognitive abnormalities in autism, and how these might manifest themselves over time. In this article, I illustrate the complexity of the disorder at the level of cognition, and stress the need to understand the underlying cause(s) by situating the study of autism within a developmental context. Autism is a complex neurodevelopmental disorder encompassing severe abnormalities in reciprocal social interaction, verbal and nonverbal communication, accompanied by restricted and repetitive behaviours and interests. These behavioural symptoms are present in very early childhood, before the age of 36 months. There is much variability in the disorder in terms of intellectual functioning, language ability, and severity of behavioural symptoms. 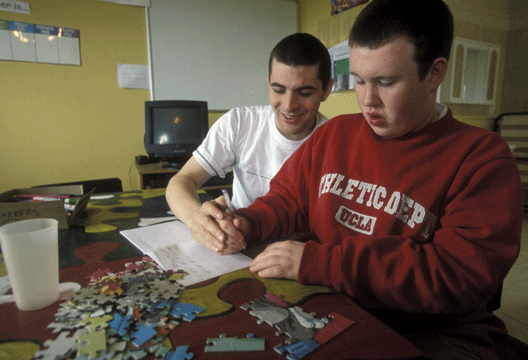 A large proportion of children with autism (between 50 and 70 per cent) have additional learning disabilities (i.e. an IQ lower than 70), while such disabilities are absent in the remaining children, who are often described as ‘high-functioning’. For some children, language is limited or absent altogether. For others, speech can be fluent, but even so, their use of language to communicate in social contexts (e.g. conversations) is odd, awkward, and often one-sided. Stereotyped and inflexible behaviours range from hand-flapping and finger-twisting to quite idiosyncratic special interests (e.g. the ins and outs of drain pipes). In recognition of this heterogeneity, researchers frequently use the term Autism Spectrum Disorder (ASD; Wing, 1996) to describe the different variants of autism, including Pervasive Developmental Disorder-Not Otherwise Specified (PDD-NOS) and Asperger syndrome. The latter is diagnosed in children with no apparent language delay, though the distinction between Asperger syndrome and high-functioning autism is somewhat blurry. Given this varied presentation, researchers have acknowledged that a complete understanding of autism will require the inclusion of multiple scientific perspectives. As such, they have adopted an approach that investigates the disorder at three levels of explanation: genetics/ biology, cognition, and behaviour (see Frith et al., 1991). In addition to interactions with the environment, there is likely to be a complex interplay between these explanatory levels. For example, abnormalities in early cognitive development could have profound secondary effects on later brain and psychological development. Likewise, the premise of early behavioural intervention is that it should capitalise on the plasticity of the developing brain to alter underlying (abnormal) brain processes. We know from twin and family studies (e.g. Bolton et al., 1994; Folstein & Rutter, 1977) that autism is largely genetic, though the identification of specific genes is proving more difficult than originally anticipated, largely due to the disorder’s heterogeneity. Research suggests that there are multiple, interacting genes involved in its inheritance (Pickles et al., 1995), and that the neurobiological abnormalities are pervasive and not confined to any one particular region of the brain (Belmonte et al., 2004). Psychologists have focused their efforts on the cognitive level of explanation in order to identify the underlying processes that might account for the various behavioural manifestations of the disorder. Historically, and in the interests of parsimony, the emphasis upon these theories has been to posit a single primary cognitive deficit that could explain the development of autism. Theories from three cognitive domains have dominated the field: 1) theory of mind – the ability to reason about the mental states of others; 2) executive control – a set of abilities important for flexible behaviour in novel circumstances; and 3) central coherence – the natural propensity to process information in context. Can a single cognitive abnormality explain autism? Despite much research in all three areas, these accounts on their own have fallen short of providing a complete picture of the disorder. Instead, they explain only part of the triad of symptoms. While difficulties in theory of mind explains well why children with autism have difficulty with joint attention, pretend play, and understanding others’ emotions, they fail to provide an adequate account for the presence of repetitive behaviours and circumscribed interests. These latter behaviours seem to be captured best by problems in executive control. And those things that individuals with autism are good at – the so-called ‘islets of ability’ (such as enhanced rote memory, good visuospatial skills, perfect pitch) – as well as some aspects of repetitive behaviours (e.g. resistance to change), can be accounted for by ‘weak’ central coherence. Consequently, researchers have begun to suspect that more than one cognitive deficit might be necessary to explain the disorder (e.g. Bailey et al., 1996). It was this possibility that first captured my interest. My initial research study was thus one of the first to tackle directly whether young children with autism were characterised by a single cognitive abnormality, or whether several coexisting abnormalities – deficits in theory of mind and executive control, and capabilities in central coherence – provided a more accurate portrayal of the disorder (Pellicano et al., 2006). A total of 40 children with ASD in Perth, Western Australia, participated in this study. All children were aged between 4 and 7 years, had diagnoses of either autism or PDD-NOS, and were considered to be high-functioning (i.e. IQ was greater than 70). A standardised diagnostic interview with the child’s mother, the Autism Diagnostic Interview-Revised (ADI-R; Lord et al., 1994), was used to confirm children’s clinical diagnosis. This group of children with ASD were compared to a group of 40 typically developing children of similar age and ability. All children performed a variety of tasks tapping each cognitive domain: false-belief tasks indexed theory of mind; tests of planning, cognitive flexibility and inhibition tapped executive control, and several tasks assessed local processing (or ‘weak’ central coherence), on which children with ASD were expected to have the advantage. The parental interview, the ADI-R, asked questions about core behaviours – socialisation, communication, repetitive behaviours – and the resulting scores were used to index symptom severity. The findings were the opposite of what traditional single-deficit models predicted. Rather than children displaying abnormalities in a single domain only, children with ASD, relative to typically developing children, performed worse on false-belief tasks, and on tests of higher-order planning, set-shifting, and inhibitory control; but they performed better than typically developing children on tasks necessitating a piecemeal or local processing style. These results suggested that there is a profile of cognitive weaknesses and strengths in young children with ASD – that there is not one deficit, but several core underlying capabilities/deficits that happen to coexist. An additional aim of the study was to investigate links between cognitive skills and severity of behavioural symptoms. One might expect that children who performed most poorly on cognitive tasks were the ones who showed the most severe symptoms, and vice versa. Surprisingly, this was not the case. Indices of autistic symptomatology (ADI-R scores) were unrelated to performance in any cognitive domain, suggesting that cognitive capabilities and deficits in these children were not associated with the behavioural symptoms they displayed. - How do the cognitive capabilities and deficits map on to the behavioural features of autism? The fact that there seems to be few links between cognition and behaviour presents problems for cognitive theories (even as part of a ‘multiple deficits’ theory). - Does this pattern of capabilities and deficits persist over time? It is unclear whether they are present in infancy, or whether they should continue to be present in adolescence or adulthood. - How do these capabilities and deficits come about, and how are they related throughout development? We simply haven’t got a causal theory encompassing multiple deficits. Are there three co-occurring cognitive abnormalities that are truly independent from each other, or does one abnormality take precedence over another during development? For example, executive problems might lead to difficulties in false-belief understanding, or a failure to develop a fully-fledged theory of mind could impede the development of executive control. Certainly, the notion of multiple deficits in autism does not render the disorder any less complex. To answer the questions above, theorists and empirical researchers alike will need to adopt a developmental perspective, and to chart the development of cognitive skills as part of longitudinal follow-up studies. Why should autism be studied in a developmental context? In the 1960s, Beate Hermelin and Neil O’Connor were among the first researchers to investigate psychological functioning in children with autism. Since the majority of the children in their sample had additional learning difficulties, a unique approach was needed in order to tease apart whether children’s difficulties were due to autism per se or a result of their developmental delay. To do this, Hermelin and O’Connor (1970) compared a group of children with autism to a group of children with learning disabilities, which were ‘matched’ on developmental level (i.e. the groups were of similar mental age). This ‘matching’ approach enabled them to work out whether children were performing at a level that was similar to, or worse than, what one might expect given their developmental level. Today, this approach is used widely throughout the autism literature and has helped to elucidate a profile of weaknesses and strengths associated with the disorder. It has certainly helped to situate autism within a developmental context. Nonetheless, the typical way that this is achieved is to test for particular behaviours or abilities at one point in time. This provides only a single snapshot of the child, and therefore allows us to say little about development. Longitudinal studies – where the same individuals are followed and tested at multiple points in time – allow one also to investigate differences between individuals. But they have the added advantage of being able to examine stability (or indeed change) within individuals over time. Parents and clinicians know that the behavioural symptoms of autism wax and wane throughout development. A 5-year-old child with autism who says only few words is very limited in the quality and quantity of their social relations. But five years on, this same child might have developed almost fluent speech. Yet these gains bring with them a whole host of different communicative symptoms, particularly in the way that language is used to negotiate social interactions. Despite this knowledge, there has been surprisingly little longitudinal research relative to the multitude of studies published every year on autism. As a result, relatively little is known about how the disorder manifests itself over time, particularly with respect to children’s cognitive abilities. The rarity of follow-up studies stems from the fact that they are very difficult to conduct; they are expensive, time-consuming, and they depend on the same group of children being available for at least two sets of assessments often separated by several years. Understanding how cognition and behaviour change over time in individuals with autism, and indeed, how these two levels are interrelated, are crucial for understanding autism as a developmental disorder. Despite there being relatively few longitudinal studies on autism, it is nonetheless important to look briefly at the types of issues addressed by existing follow-up studies. There have been several long-term longitudinal investigations of individuals diagnosed during the 1970s. Quality of social adjustment, in terms of employment status, living arrangements, and social relationships, has been the primary focus of these outcome studies (e.g., Howlin et al., 2000, 2004). Other studies have examined the stability of IQ and language (e.g. Venter et al., 1992; Sigman & McGovern, 2005), and early predictors of later outcome (e.g. Charman, 2003; Sigman & Ruskin, 1999). This latter issue is important in establishing early precursors for later development and assists in targeting behaviours in studies of early intervention. Two additional areas of research that are especially interesting and relevant to my own work are the stability of behaviour (in terms of symptom severity and clinical diagnosis) and the stability of cognition – theory of mind, executive control, and ‘weak’ central coherence – over time. Consistent with clinical observation, follow-up studies have demonstrated that autistic symptomatology is liable to change over time. Using standardised interviews with parents, retrospective (e.g. Piven et al., 1996) and prospective (e.g. Charman et al., 2005) studies have shown that social and communicative symptoms improve significantly with time. There is less movement, however, in the area of restricted and repetitive behaviours, with parents reporting little change over time. Findings of this sort have led some authors to suggest that there might be different developmental trajectories for each of the symptom domains (Charman et al., 2005). Despite there being considerable change in symptom severity over time, there is notable continuity with respect to clinical diagnosis. Several studies have shown that the majority of preschoolers diagnosed with an ASD retaining a spectrum diagnosis in late childhood, adolescence, and early adulthood (e.g. McGovern & Sigman, 2005; Sigman & Ruskin, 1999). In recent years, there has been an increased emphasis on the early identification of autism (e.g. Cox et al., 1999), and researchers have sought to establish whether the diagnoses of children as young as 2 years are reliable. Recent studies following these children have reported that the original clinical diagnosis at age 2 seems to withstand the test of time: between 90 and 100 per cent of children with autism continue to show sufficient symptoms to warrant an ASD diagnosis at age 7 (Charman et al., 2005) or age 9 (Lord et al., 2006). At the level of behaviour, then, there seems to be both continuity and change with time. What about at the level of cognition? Plotting children’s cognitive skills across time enables researchers to pinpoint whether cognitive skills follow a similar, developmental pathway to that of typically developing children, but at a later (delayed) starting point, or whether the developmental pathway deviates altogether from that of typically developing children. According to traditional theoretical models, a cognitive abnormality should persist over time if indeed it is central to the disorder. Unfortunately, there have been only a handful of studies investigating the stability of cognitive capabilities/deficits in autism. With respect to theory of mind, initial reports suggested very little improvement in false-belief understanding over a period of three (Ozonoff & McEvoy, 1994) or seven (Holroyd & Baron-Cohen, 1993) years. More recent work, however, has shown significant improvements on a range of theory of mind tasks in children with ASD, which seem to be linked largely to children’s language abilities (Steele et al., 2003). The studies looking at progress in children’s executive abilities indicate that planning ability and the ability to flexibly shift attention undergo little change over time (Griffith et al., 1999; Ozonoff & McEvoy, 1994). As yet, there has been no study examining continuity in central coherence. Longitudinal research so far has demonstrated both stability and change at the levels of behaviour and cognition. The small number of studies focusing on cognitive skills, however, limits the types of conclusions that can be drawn. In order to attempt to redress the balance in research, I have recently completed a 3-year follow-up study of the West Australian children described earlier (Pellicano et al., 2006). The amount of change seen in both groups of children was remarkable, but particularly so for the group of children with ASD. Children, whose speech three years ago was very limited, now used sophisticated language (though often in the face of recurrent grammatical errors). Children whose behaviour had once consisted largely of repetitive hand mannerisms and repetitive speech were now much more flexible in their behaviour and showed fewer repetitive features. Children who had once failed to establish eye contact were beginning to now monitor the gaze of others and could use some gestures (e.g. pointing) to communicate. The findings from this follow-up study await detailed analysis. Such analysis should, however, provide some answers to the following four questions. First, what are the concurrent relationships between cognitive capabilities/deficits? In the original study, capabilities and deficits were related in particular ways: ‘weak’ central coherence was unrelated to theory of mind ability, but was associated with aspects of executive control, and theory of mind and executive functions were significantly interlinked. It will be important to determine whether this pattern of interrelationships remains constant over time. Second, what are the developmental relationships between cognitive capabilities/deficits? That is, what are the early cognitive predictors of later cognitive functioning? For example, does early executive control predict later theory of mind ability, or vice versa? These types of questions entail the consideration of relationships between theoretical models, and might allow me to draw some conclusions about the relative precedence of cognitive abnormalities in ASD. Third, what are the concurrent and predictive associations between cognitive and behaviour? As part of the follow-up study, I assessed multiple aspects of behaviour (e.g. symptom severity – both observational and parental report – adaptive skills, language competence), which might increase the possibility of revealing potential (concurrent and predictive) links between cognition and behaviour. Finally, and importantly, what role does language play? Early language ability is a significant prognostic indicator (Venter et al., 1992), and so it will be vital to determine the extent to which language affects children’s outcome. These aims are ambitious, and might only be tackled sensibly once children have been followed through to adolescence and early adulthood. Teasing apart the complex causes of autism will depend ultimately on the integration of information at all three levels of explanation – genetics/ neurobiology, cognition, and behaviour. This pursuit, though, must be addressed longitudinally if we are to appreciate fully the changes that take place throughout development. - Liz Pellicano is Lecturer in Developmental Psychology, Department of Experimental Psychology, University of Bristol. E-mail: [email protected]. What are the implications of a multiple-deficits model of autism in terms of early intervention and long-term education? Do changes in symptomatology over time reflect changes in underlying cognitive processes? Or do they reflect compensatory mechanisms employed by the child? Why are there different developmental pathways for the three symptom domains of autism? Is this combination of cognitive capabilities and deficits also seen in less able children with autism? Bailey, A., Phillips, W. & Rutter, M. (1996). Autism: Towards an integration of clinical, genetic, neuropsychological and neurobiological perspectives. Journal of Child Psychology and Psychiatry, 37, 89–126. Baird, G., Simonoff, E., Pickles, A. et al. (2006). Prevalence of the disorders of the autism spectrum in a population cohort of children in South Thames. The Lancet, 368, 210–215. Belmonte, M.K., Cook, E.H., Anderson, G.M. et al. (2004). Autism as a disorder of neural information processing. Molecular Psychiatry, 9, 646–663. Bolton, P., MacDonald, H., Pickles, A. et al. (1994). A case-control family history study of autism. Journal of Child Psychology and Psychiatry, 35, 877–900. Charman, T. (2003). Why is joint attention a pivotal skill in autism? Philosophical Transactions of the Royal Society of London Series B, 358, 315–24. Charman, T., Taylor, E., Drew, A., Cockerill, H., Brown, J. & Baird, G. (2005). Outcome at 7 years of children diagnosed with autism at age 2. Journal of Child Psychology and Psychiatry, 46, 500–513. Cox, A., Klein, K., Charman, T. et al. (1999). Autism spectrum disorders at 20 and 42 months of age. Journal of Child Psychology and Psychiatry, 40, 719–32. Folstein, S. & Rutter, M. (1977). Genetic influences and infantile autism. Nature, 265, 726–728. Frith, U., Morton, J. & Leslie, A.M. (1991). The cognitive basis of a biological disorder: Autism. Trends in Neurosciences, 14, 433–438. Griffith, E.M., Pennington, B.F., Wehner, E.A. & Rogers, S.J. (1999). Executive functions in young children with autism. Child Development, 70, 817–832. Hermelin, B. & O’Connor, N. (1970). Psychological experiments with autistic children. Oxford: Pergamon. Holroyd, S. & Baron-Cohen, S. (1993). Brief report: How far can people with autism go in developing a theory of mind? Journal of Autism and Developmental Disorders, 23, 379–386. Howlin, P., Goode, S., Hutton, J. & Rutter, M. (2004). Adult outcome for children with autism. Journal of Child Psychology and Psychiatry, 45, 212–229. Howlin, P., Mawhood, L.M. & Rutter, M. (2000). Autism and developmental receptive language disorder: A follow-up comparison in early adult life. Journal of Child Psychology and Psychiatry, 41, 561–578. Lord, C., Rutter, M. & Le Couteur, A. (1994). Autism Diagnostic Interview – Revised. Journal of Autism and Developmental Disorders, 24, 659–685. Lord, C., Risi, S., DiLavore, P.S. et al. (2006). Autism from 2 to 9 years of age. Archives of General Psychiatry, 63, 694–701. McGovern, C.W. & Sigman, M. (2005). Continuity and change from early childhood to adolescence in autism. Journal of Child Psychology and Psychiatry, 46, 401–408. Ozonoff, S. & McEvoy, R.E. (1994). A longitudinal study of executive function and theory of mind development in autism. Development and Psychopathology, 6, 415–431. Pellicano, E., Maybery, M., Durkin, K. & Maley, A. (2006). Multiple cognitive capabilities/deficits in children with an autism spectrum disorder. Development and Psychopathology, 18, 77–98. Pickles, A., Bolton, P., Macdonald, H. et al. (1995). Latent-class analysis of recurrence risks for complex phenotypes with selection and measurement error: A twin and family history study of autism. American Journal of Human Genetics, 57, 717–726. Piven, J., Harper, J., Palmer, P. & Arndt, S. (1996). Course of behavioral change in autism. Journal of the American Academy of Child and Adolescent Psychiatry, 35, 523–529. Sigman, M. & McGovern, C.W. (2005). Improvement in cognitive and language skills from preschool to adolescence in autism. Journal of Autism and Developmental Disorders, 35, 15–23. Sigman, M. & Ruskin, E. (1999). Continuity and change in the social competence of children with autism, Down syndrome, and developmental delays. Monographs of the Society for Research in Child Development, 64, 1–142. Steele, S., Joseph, R.M. & Tager-Flusberg, H. (2003). Brief report: Developmental change in theory of mind abilities in children with autism. Journal of Autism and Developmental Disorders, 33, 461–467. Venter, A., Lord, C. & Schopler, E. (1992). A follow-up study of high functioning autistic children. Journal of Child Psychology and Psychiatry, 33, 489–507. Wing, L. (1996). Autism spectrum disorder. British Medical Journal, 312, 327–328.